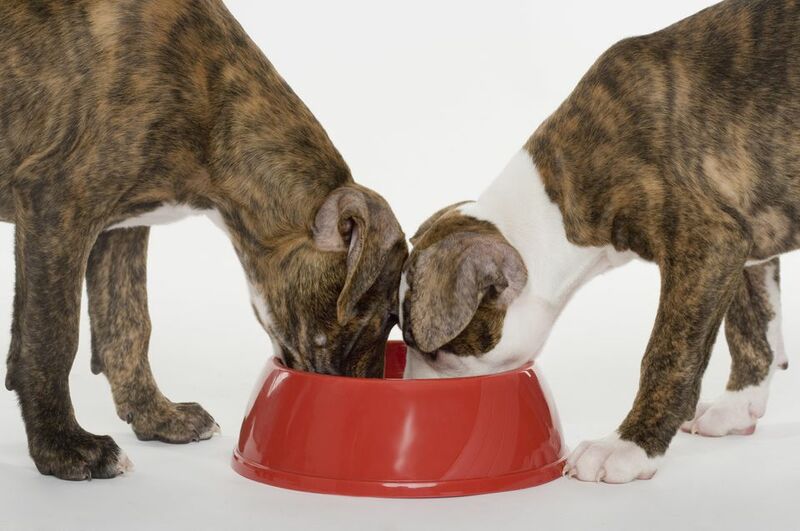 There are several reasons pet owners may choose to feed their dog wet food instead of or in conjunction with dry kibble. For one, wet food often contains more protein and fewer carbohydrates than dry food, and because it’s sealed in airtight packaging, it usually has fewer preservatives. Further, it can help to keep dogs hydrated, as it contains higher moisture content. However, the downside of wet dog food is that it is generally more expensive than dry food. If you're thinking about adding wet food into your dog's diet, you're probably searching for a high quality brand of canned dog food. There are a lot of options to choose from out there, including special formulas for seniors, puppies, sensitive stomachs, weight loss, and more. Here are some of the top rated canned dog food options on the market today, all of which will help keep your pup satisfied and healthy. 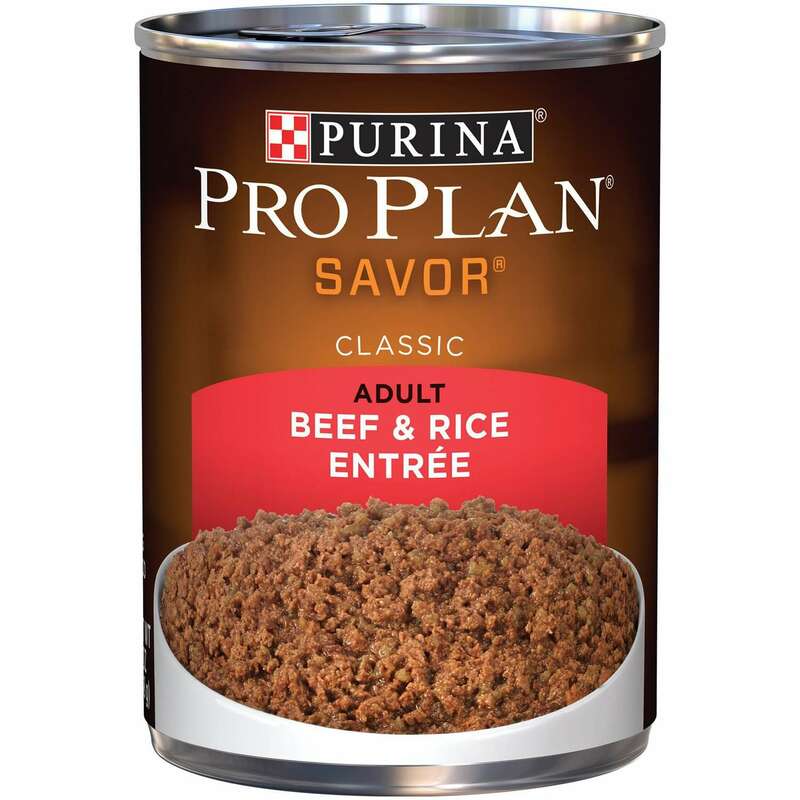 For canned dog food that's incredibly healthy and sure to whet your dogs appetite, you can't go wrong with Purina Pro Plan SAVOR Adult Wet Dog Food. This product comes in either 5.5 or 13-ounce cans, and it's packed with nutrients that will help maintain your dog’s health. Reviewers rave about the quality of this dog food and its reasonable price. Almost all agree that their dogs love the taste of the food, and several note that their pups seem healthy and happy with this in their diet. Full-size cans of dog food might be too much for a small dog to eat, which is why the Cesar Classic Wet Dog Food Variety Packs are perfect for small dogs. These highly-rated packs are perfectly proportioned for small dog breeds, and they won't break the bank. You can choose from a variety of tasty flavors such as filet mignon, chicken, beef stew, and a New York strip. Each pack is fortified with vitamins and minerals to keep your pooch healthy, and each tray comes with a peel-away freshness seal. Cesar Classic Wet Dog Food Variety Packs have thousands of positive reviews from users who say it's the only food their dogs will eat! Reviewers love that this food is packed with healthy ingredients, and several even noticed a difference in their dog's coat. As dogs get older, they have more specific nutrition needs. It's important to get your senior dog food with lean protein to help maintain muscle and controlled levels of certain nutrients to keep their organs in optimal health. One of the best-canned foods for senior dogs is the Hill's Science Diet Senior Dog Food. This canned dog food is specially designed with older dogs in mind. It comes in several tasty flavors, and the cans contain 5.8 ounces of food. The formula has precisely balanced nutrition to help sustain mobility and muscle mass, and it's high in lean proteins but low in sodium and phosphorus. The brand uses high-quality ingredients to facilitate nutrient absorption, helping to promote a healthy body weight and healthy organs in dogs over age seven. Several reviewers say this food was recommended to them by their vet, and the majority agree that their dogs love the taste. Several note their older dogs seem to digest this food easily, and as an added bonus, the price for this canned dog food is reasonable. Puppies need certain nutrients to help them grow and thrive, just like children. For a canned dog food that’s specially formulated for puppies, you may want to try the Blue Buffalo Homestyle Recipe Puppy Chicken Dinner. This product comes in 12.5-ounce cans, and each can contains healthy ingredients that will promote muscle growth and cognitive development in your puppy. Blue Buffalo food is made with hearty ingredients like real deboned chicken, brown rice, garden vegetables, blueberries, and cranberries (which provide a boost of antioxidants). It's formulated without corn, wheat, or soy. People say their puppies go nuts for the Blue Buffalo Homestyle Recipe Puppy Chicken Dinner, often begging for more. Reviewers like that you can actually see the peas and carrots mixed into the food, and several others noted that their puppies experienced healthy bowel movements while eating this formula. If your dog has a grain sensitivity or you just prefer to feed them grain-free foods, one of the best options out there is the Taste of the Wild High Prairie Grain-Free Canned Dog Food. This top-rated canned dog food is made with real meat and a variety of other easily digestible ingredients to keep your dog happy and healthy. This wet food comes in 13-ounce cans, and real beef is the first ingredient. It also contains roasted lamb and venison, as well as vegetables like peas, potatoes, and sweet potatoes. That's not all though—the Taste of the Wild dog food also contains tomatoes, blueberries, and raspberries to support a healthy immune system. According to reviewers, this food is great if your pet has allergies to common food ingredients. Almost all say their dogs love the taste, and many have noticed that their pups have fewer stomach problems when eating this food. There are a variety of reasons people put their dogs on a vegetarian or vegan diet. For one, some dogs have allergies to meat protein that can cause unpleasant side effects. Further, a vegetarian diet may be helpful in the treatment of medical problems such as liver disease or kidney stones. If you're looking for vegetarian-friendly canned dog food, one of the top rated options is the Natural Balance Ultra Premium Wet Dog Food in the Vegetarian Formula. This product comes in 13-ounce cans, and it’s a true vegan dog formula—no dairy or animal ingredients—made from brown rice, oatmeal, peas and potatoes. Reviewers call this canned dog food from Natural Balance a “miracle dog chow” for pups with allergies. Many say it smells surprisingly good, even for dog food, and it helps reduce their dogs’ stomach issues. If your dog has a sensitive stomach, you may need to invest in a dog food that's easy on the digestive system. One of the best options on the market is Hill's Science Diet Adult Sensitive Stomach & Skin Dog Food, which is nutritious and easy to digest. This salmon-flavored dog food comes in 13-ounce cans, and it's perfect for dogs with sensitive stomachs and skin. Their high-quality formula uses easy to digest ingredients, while still providing pups with the proper vitamins and nutrients. The food contains natural fiber from real vegetables to support digestive health, and a blend of antioxidants and vitamins to boost the immune system. Pet parents whose dogs have allergies or are picky eaters say that this product is their go-to. Many note that the Hill's Science Diet Adult Sensitive Stomach & Skin Dog Food improved their dog’s skin and/or coat, as well as reduced stomach issues. Canine obesity is a fast-growing health problem that can lead to other dangerous conditions. If your vet has recommended a doggy diet for your canine, you'll need to use a combination of food and exercise to help shake off that excess weight. The Hill's Science Diet Dog Food for Healthy Weight and Weight Management is specially designed for adult dogs who are overweight or those who are less active and need to maintain a healthy weight. This chicken and vegetable dog food comes in 13-ounce cans, and it contains prebiotic fibers to help promote nutrient absorption and gentle digestion. The company claims that 70 percent of dogs who eat this food lose weight within 10 weeks, and many reviewers back up this claim with stories of their own dogs’ weight loss.